Modern detached cottage overlooking countryside views in central Gower. 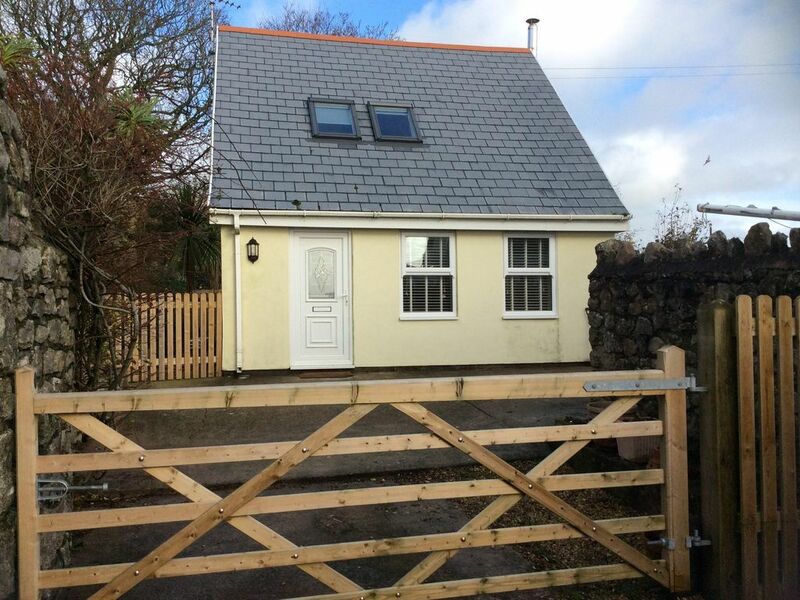 Berry Garden Cottage is a lovely modern, light and airy cottage tucked away in the peaceful hamlet of Berry, where you are just 10 minutes drive from the award winning beaches of Port Eynon, Rhossili and Oxwich. Newly converted and very tastefully presented, the downstairs has a lovely open plan living/ kitchen/ dining room, with a modern wood burning stove, large plasma TV and DVD, two very comfortable sofas and dining table to seat four. The kitchen is very well equipped with a gas hob and oven /grill, microwave, toaster, kettle, large fridge freezer, washing machine and dishwasher. There is also a separate cloakroom and downstairs shower room with shower. Upstairs there are two lovely light and airy bedrooms and a separate bathroom with three quarter bath and shower attachment. The bedrooms are furnished with traditional style cast iron beds, bed side table with lamps and a wardrobe. Both bedrooms have Velux windows with views over farmland and surrounding countryside. To the back of the cottage there is a small self-contained garden with patio table, chairs and a BBQ which catches the morning sun as well as a pretty patio area to the front with table and chairs. Bed linen & towels provided. Shops & local amenities close by, off road parking for two cars, fully central heated, well behaved dogs welcome by prior arrangement. Sorry no children under the age of 8 unless babes in arms. Perfect for couples, walkers, needing a relaxing break or an action-packed countryside beach holiday. combination tub/shower, The bath is a 3/4 bath with shower attachment. toilet, shower, Bathroom 2 is downstairs. The nearest beach within walking distance is Horton beach (35/40 mins) via ancient footpaths and green lanes. Port Eynon is approx 6/7 minutes by car. Parking for two cars available. One directly in front of the cottage and one on a shared drive/parking area to the front of Berry Hall. Please advise how many cars on booking. One basket of complimentary logs supplied 1st Oct to Apr 30th. Further wood to be purchased from owner please to ensure only suitable wood used. Nescafe Dolce Gusto Jovia De'Longhi coffee maker. I box of complimentary coffee supplied. Enclosed front and rear garden, lawn at rear. A lovely quiet location in Berry. Very dog friendly as totally enclosed garden. The cottage had really lovely beds , sofas etc . Lots of little extra bits that you forget when packing such as hand soap and tea towels.Wendy was very welcoming and lives next door Incase any problems arise . We will definitely return to see the rest of the Gower. Such a great place to stay . Immaculate property with thoughtful attention to little details. Superb location for the best walks and beaches, plus really nice eating and drinking in Port Eynon. We can’t think how it could be any better.